These emerging technologies and solutions certainly are not unique to financial services. 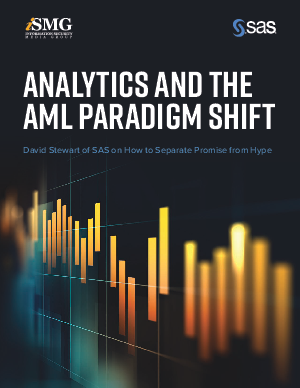 But Stewart, a business director of security intelligence solutions within the SAS Security Intelligence Practice, sees particular interest and application in AML circles. "There remain a good number of manual processes within financial crimes departments in financial institutions, and AI can help automate some of those rote tasks such as document review or alert triage," he says. "Due to investments in technology, there is a lower barrier of entry for midsized institutions. "And finally, there's this anxiety over the unknown - those risks they are not able to detect, that may be hidden using traditional techniques - so they're hoping that more advanced, unsupervised learning techniques can be used to identify those edge cases or behaviors that are out of norm." • The SAS approach of "crawl, walk run" when it comes to adopting new analytics tools.